Use an advantage of Eibach Flash Sale at CARiD! Flash Sale from Eibach! Take the performance of your Toyota 4Runner to the next level! 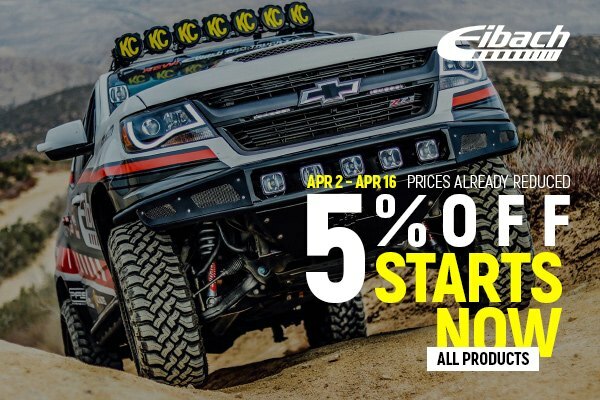 Now until April 16 order any Eibach product with 5% OFF the original price. Hurry up to take advantage of this exclusive spring offer. Prices are already reduced. When it comes to adjusting the height of your ride without compromising on any performance aspects Eibach is the right way to go. Their suspension products provide enhanced cornering ability, reduced body roll, immediate response, increased stability and an aggressive performance stance. Eibach product line includes lift and lowering springs, anti-roll bars, links, coilover spring/shock assemblies and much more to take your driving experience to the next level. All Eibach parts are built of corrosion-free stainless steel internal lines and components. Eibach has engineered and tuned components to make the most of any extreme driving situation. Find the best suspension solution for your Toyota 4Runner from Eibach and save your cash! Quick Reply: Use an advantage of Eibach Flash Sale at CARiD!